This entry was posted on January 6, 2015 by Tintean Editorial Team/fdg, in Features, Fiction, News and tagged Adrian McKinty, Belfast noir. Bookmark the permalink. 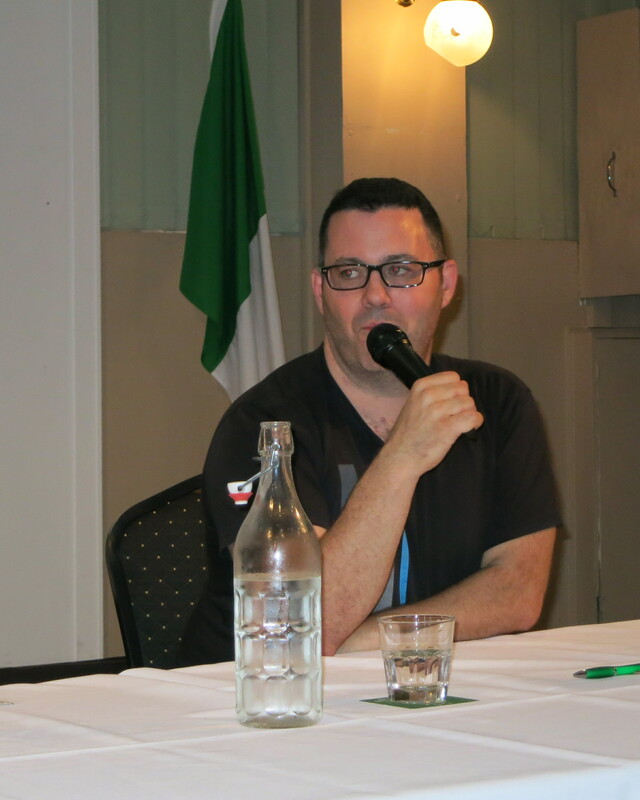 On 17 December 2014, Adrian McKinty, a master of Belfast crime fiction now living in Melbourne, was interviewed in the Celtic Club by Felicity Allen, one of the Tinteán editors, about his Sean Duffy trilogy. 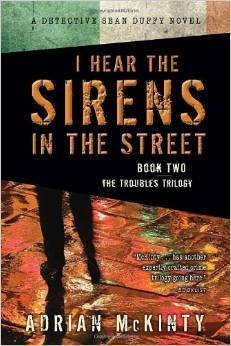 By popular demand, the trilogy is soon to be extended to a fourth novel. This development is not surprising, despite the author’s stated commitment to writing in threes, as Sean Duffy is a most intriguing cop – or should I say peeler. His pedigree is 40s noir; his character is ‘smart-arse’ (part of the tradition) but also quirky, combative, and erudite (especially in a literary sense); he’s out of place as the only Catholic in the Carrickfergus police station and on Victoria Road. The events on which the novels are based are historically and geographically realised and based in real events, like the failure of the DeLorean factory and the bomb that nearly killed Maggie Thatcher and did kill Conservative politicians in Brighton, during Maggie Thatcher’s Conservative convention in 1984. One feels, rightly or wrongly, and some with a better knowledge of Belfast politics than myself might want to take this issue up in this forum, that the books position the reader as an insider to some passionate and intractable hard-nosed realities. 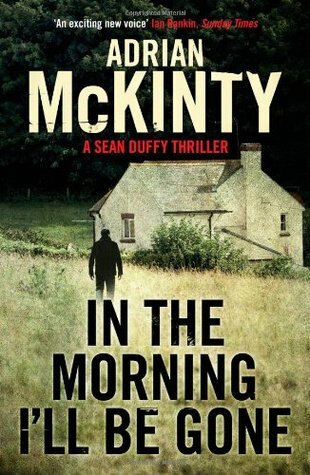 The Sean Duffy novels are the apogee of McKinty’s career to date, and represent a huge advance over his earlier novels, partly because they rely on wit and guile (whereas the earlier ones seem to use thuggery at critical plot points) and precisely because they draw on known political realities. Adrian McKinty Interview at the Celtic Club. Photo by Ronan, Deputy Manager at the Celtic Club. performance and began interviewing him themselves. He has won a world-wide reputation, and it seems already has a sizable fan-base in Melbourne. Belfast’s loss is Melbourne’s gain as he has resettled his American wife and children here and taken out citizenship. They were at the Club too. In the interview, McKinty sketched out his own immersion in Northern Irish politics as an unwitting child who for a while was being driven to school by a kindly Major in the British Army. He got used to looking for mercury tilt switch bombs (which could be activated by the car hill-climbing or descending) before setting out, but eventually freaked out on an occasion when the officer on a snowy February morning could not be bothered doing so. It was the end of the lad’s free ride to school, but the beginning of a political education, and his initiation into sectarian fear. Walking seemed infinitely preferable to the risks. McKinty made much of how such fear was an ordinary part of the fabric of day to day life in Belfast in the 1970s and 80s. It wasn’t until he left Northern Ireland for university in Coventry in England that he discovered that religion didn’t need to be the defining category of everyday life, and that no-one much gave a toss for religious identification in England. However, such experiences of religious, economic and ethnic difference were to become the stuff of his best fiction, and to constitute a mine-able lode which enabled him to explore what it is to be an outsider in one’s own country. The novels are full of amiable banter about religious conversion between the Protestant sergeant who is a Bible specialist and Duffy who speaks multiple languages, quotes poetry and is a cosmopolite. Asked if NI Protestants read the novels with pleasure, he reported that they were least liked by fundamentalists – especially right-wingers who have trouble with gay rights and who admire the late Paisley. As noted above, geographical realism is a feature of the Duffy novels. They are set on the street where he grew up, one of only two Catholic families in the estate. The family was never burnt out and experienced Victoria Road as being tolerant but nonetheless they were schooled in religious difference from the earliest age. McKinty stressed that despite their geographical and historical verisimilitude, the novels aim for emotional truth – the ecstatic rather than the accountant and copy editor’s truth. So, he recreates the marching season, riots, roadblocks, paramilitary manoeuvres, shotguns, and for pubs where smoking and Guinness and overboiled food are the dominant smells. McKinty’s Belfast is a sad place. He reported that 25% of his class at school joined paramilitary groups; one quarter were in prison; another quarter emigrated and the final 25% were unemployed. The 17th century battles, he finds, live on in the North. Frances is on the editorial team of Tinteán.